This summer, as I've listened to the last of the Harry Potter series and started The Lost Hero with my family, I've enjoyed our conversations about the characters, the conflicts, and the setting. Each year, I try to replicate these kinds of conversations in my classroom. Teaching story elements is a great way to begin. When kids can identify story elements, they can pick out the parts of the story that fit together and start to talk about them coherently. Who are the characters? What is the setting? What is the main problem in the story? Of course, teaching story elements needs to go much deeper than simple identification. Filling out a story map quickly becomes a dull classroom routine without an inspiring conversation to go along with it. In fourth grade, I like to ask students provoking questions about characters. These questions stimulate our discussion and help students to see story elements as being more than just disassembling a story. When we have these conversations, I can judge from student responses where to go next. Sometimes I do hear the sound of crickets. This tells me that I've tried to move too far too fast, and that kids need some time before we can have this particular conversation. Sometimes their responses remind me of a fabulous book that I just have to share--a character who is similar to one of their favorites, or a character who acts the opposite of what is expected. Most importantly, these kinds of questions bring a spark of "what if?" to our classroom...a spark that lights up the room with the love of reading. -My Story Elements PowerPoint is a classic that I do come back to, year after year. -I wrote some fun Story Elements Readers Theatre scripts for my students to share. -Analyzing Story Elements is finally ready. Four new stories with before reading pages, questions, and activities to help students understand and analyze story elements. I've reached 1,500 followers over on TeachersPayTeachers! This is a big milestone for me and really means a lot. I have always felt a little hesitant to write and share my writing with the larger world. The writer-me wants to go into a dark corner and hide; the teacher-me says, "I need an article to teach this topic!" and I don't have a choice except to go and write. To celebrate, I have 15 items on sale for 15% off. The sale lasts until Saturday. Here are some glimpses into the process and my favorite items. Cause and Effect Activity and Texts: This is still one of my favorite units. When I had trouble finding suitable cause and effect texts for my students, I started writing my own. Over the years I have added multiple articles so that there are 9 altogether. My favorite is "Forgotten Fruits"--last summer I was able to track down and try a pawpaw for the first time! These articles have been so much fun to write. Everywhere we go I look for more inspiration for interesting details that can become the basis of a cause and effect text. Chronological Order Texts: When I wrote this, I wanted to have a collection of articles that reflect the varying nature of chronological order text. Sometimes chronological order is about an animal's life cycle, sometimes it is about a person's life, and sometimes it is about a historical event. Even procedural text is written in chronological order. By far my favorite text to write in this packet was "Whoopie Wars". After all, I had to make whoopie pies to really understand the topic, right? But my research into the life of Dolley Madison was just as interesting, and making the fabric scrap Easter eggs for the procedural text was a favorite activity for my children. 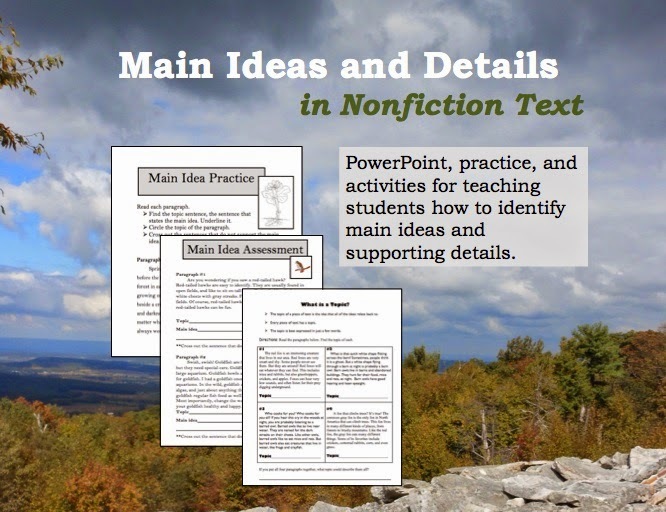 Main Ideas and Details in Nonfiction Text: This unit has been revised and added to many times, probably because I learn new things every time I teach nonfiction. This year's addition: two new texts, one with the topic of skinks (item 24). My students were fascinated by these common lizards. The cover picture is from a hawk-watching spot north of me--isn't it gorgeous? I went hoping to catch some photos of hawks, not realizing how underpowered my poor little camera is for such a task. Still, it was a fun hike and my children enjoyed it. Paraphrasing and Summarizing Lessons: The next time you read a professional book, take a moment to think about all of the things that the author had to leave out for space reasons! I had many items that didn't make it into my summarizing book, and those items formed the basis of this unit. I expanded the unit with more articles, including "Mysterious Mushrooms" and "SR-71". My husband, who teaches third grade, requested another airplane article, so I added "The A-10 Thunderbolt". He says the kids love it. Airplane texts are really hard for me to write as I don't have as much background knowledge about airplanes. Luckily, my older son is happy to show me around the Smithsonian Air and Space and the Udvar-Hazy Center and share his wisdom. Sometime soon I have to write about swept-wing aircraft--I never realized what an innovation they were until he told me about them. Character Traits and Emotions: This unit includes resources that I started creating when I was working on The Forest and the Trees. My students loved writing dialogue to show different character traits! Over the years I've added more activities, stories, and a PowerPoint. I especially like teaching with "Thomas and the Teapot"--it was one of those stories that just writes itself. 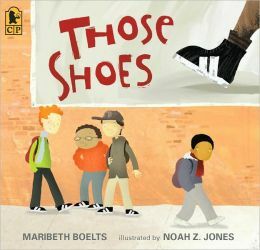 Even early in the school year this story can get kids talking and sharing their viewpoints. 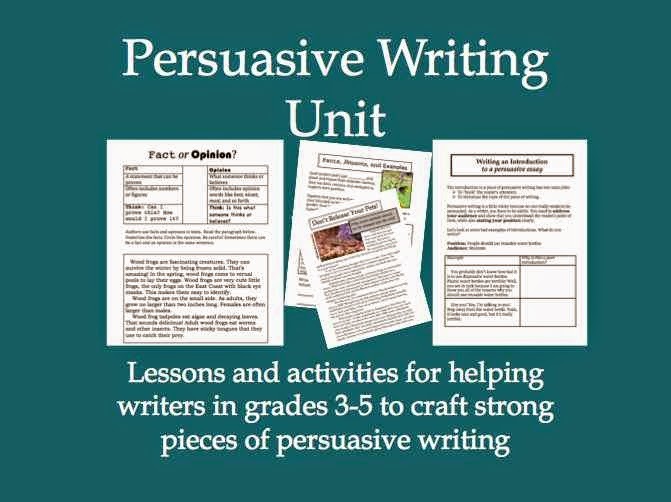 Persuasive Writing Unit: This file was originally just a fact and opinion PowerPoint. Oh, how times have changed! I always seem to come to this in the spring when things are incredibly hectic, and I like having the lesson plans to look back to. I wrote the text "Don't Release Your Pets!" after a real life incident at a creek. We were cleaning up from kayaking when a woman came by with two large fish that she was releasing into the creek. "We just don't want to have them anymore," she said cheerfully. I was kind of shocked and I realized that not everyone knows that releasing your pets into the ecosystem is a bad idea. (I ended up taking the fish home...) The topic turned out to be a good one for a persuasive text, and every year kids are intrigued by the anecdotes in the essay. It is a pleasure to dream up new texts, format them, and share them for other teachers to use in their classrooms. Thank you so much for everything! In our curriculum, we start the school year with stories and story elements. I love this beginning as it helps us to talk about big ideas like theme and summarizing. But I also realize that, to help students figure out these big ideas, sometimes we need to focus on smaller details. One of these small details is dialogue. In a story, dialogue can serve many purposes. Sometimes dialogue shows us insight into a character's personality or motives. Dialogue can also move the story forward and reveal information. Skipping over dialogue would lead to a fractured reading experience. And yet...many young readers have great trouble in figuring out who is speaking in dialogue! The tiny clues to skilled readers use to match speaker to speech are invisible to many young readers. They don't notice the paragraph breaks or the empty white space at the end of lines. They can't track split dialogue. When speaker tags are not included, they have trouble following the back-and-forth of a typical conversation. Figuring out who is speaking is a kind of text-based inference. Readers need to combine the clues in the text with their background knowledge of how text works. And this is hard! Even readers who are on and above grade-level can struggle with dialogue. I like to sit with kids as they are reading. Sometimes I listen to students read, and sometimes we read aloud together. During these conversations, I ask, "Who is speaking?" or "How do you know who is talking at this point?" These conversations help me to figure out the sub-conscious rules that students are or are not using to figure out who is speaking. With a document projector or overhead projector, show students the text that you are reading aloud. I like to make little sticky note tags or even little sketches of the characters to display at the same time. Then, I go back and forth to show who is speaking at each point. It's fun to engage students in this as well. This requires some colored pencils. Give students a copy of a short piece of text, and talk explicitly about the rules of dialogue. What does it mean when a new paragraph begins? How can we tell that a person is still speaking? Underline dialogue by different characters in different colors. You can extend the conversation by talking about what the dialogue reveals. Does it show us what characters are like? Reveal details of the plot? An example of this activity is included in the Literature Circle Materials below. In the past I saved some of these lessons for later in the year. This year, though, I think that I will face them early on. Understanding the little rules of print and the conventions that authors follow will only help us as we begin our exploration of stories and narratives. Some other lessons for teaching about text-based inferences and understanding dialogue can be found in my book The Forest and The Trees. Character Traits and Emotions: Making Inferences: This unit includes an activity in which students write dialogue to show character traits. 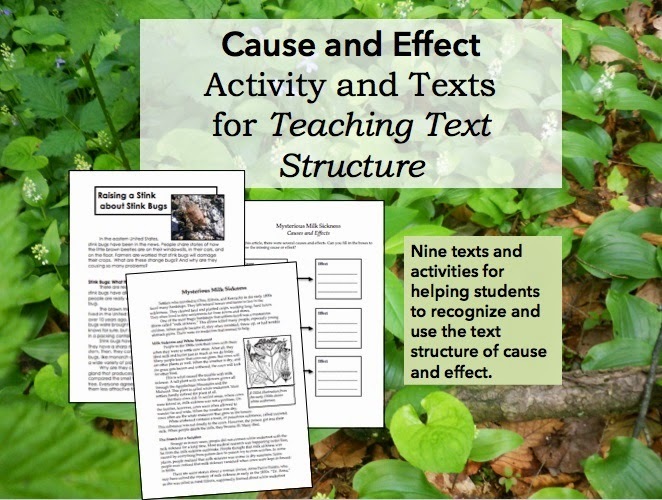 Text-Based Inferences and More: This pack includes more resources for teaching text-based inferences. Can you just take any book off the shelf and use it for teaching theme? Yes and no. Every story has some kind of theme, but some are harder to find than others. Also, some stories point to only one theme. I prefer to teach with stories that have multiple themes. 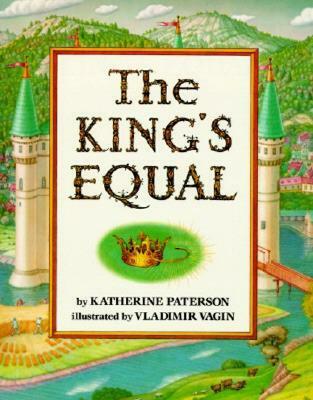 These stories yield some rich discussions as students try to support their thinking. This is a sweet story of a boy who wants "those shoes", but can't afford them. It resonates with my students and is an example of how a small, slice-of-life story can still carry a theme. Students like to try to wordsmith different themes for this story, but the concrete plot line makes it easy for them to support a theme that works. This inexpensive paperback is a great choice for a classroom library or teacher bookshelf. Every time I teach this book I love it a little more! Wesley's journey from tormented victim to intrepid adventurer is a wonder to behold, and Paul Fleischman is just an amazing writer. The kids love the illustrations as well. 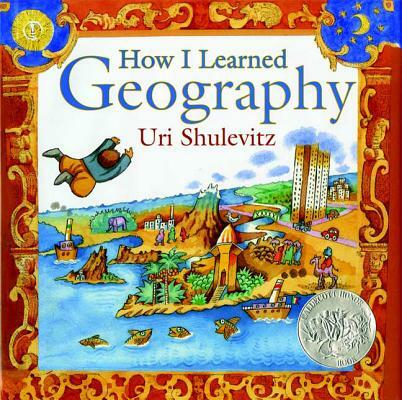 This book is one that I revisit throughout the year, as we look at maps in our geography unit, as we work on personal narratives, and as we explore theme. It is more of a memoir and is alternately classified as "autobiographical" or a "fictional recasting". Whatever the line between fiction and reality, this book is great to share. My kids think it is interesting that our home state of Pennsylvania is included in a list of faraway places--they have never considered that their everyday ordinary is someone else's distant exotic. Students often have different ideas about the theme. Some bring up the event of the father buying the map instead of buying food, while others focus on the narrator's use of imagination. This is another book which has character change at the heart. It would make a nice companion book to Weslandia, as City Green also shows plants making a difference to people's lives. Students passionately argue for various themes in this story, depending on whether they focus on the character of Old Many Hammer or Marcy. I love it when they can support their thinking! Students love this book! It really shows how a mistake can be turned into something positive. This book has a stated theme, which leads us into a discussion of paraphrasing versus quoting. Should we put the theme into our own words? Should we use quotation marks to show that we are stating the words of the author? These questions are just perfect for beginning of year fourth graders. There are so many other great books that you can use to teach theme. What are your favorites? Although they might seem quite different, teaching theme and teaching summarizing have some similarities. Both require teachers to help students see beyond the clutter of details to reach for the gist of the story. An understanding of theme enhances a student's summary of a story--and knowing how to summarize helps readers to infer themes. When planning for a school year, it almost becomes a chicken and egg problem--which should we teach first? For me, the answer is neither. And both. (This is what makes me so frustrating to the people I work with!) Looking at summarizing narratives and theme as an ongoing exploration instead of a one-and-done unit leads to much deeper learning and far better discussions. These ideas are so intertwined that they cannot be reduced to step one, step two, step three teaching. Instead, they can become a shared foundation for a new community and classroom. Just like teaching summarizing, teaching theme can be frustrating. Many young readers are very literal and confuse theme with plot. After all, many authors never state a theme directly. It can be confusing for young readers to "find" something that, from their perspective, isn't even there! Theme bulletin board: I like to display common themes on a bulletin board that I keep up for most of the year. My formatted theme set is available free from Slideshare, or you can make a more beautiful version that fits in with your classroom decor. As we read different stories, we write titles on notecards and add them to our bulletin board. This helps students to see that stories with very different plots can share themes--an idea which will become important as we compare stories later. Read aloud: Starting the year with many short read-alouds helps us to think about summarizing and theme at the same time. I don't map out my read-alouds weeks in advance--instead, I have a handy selection of my favorite books that I choose from each day. I just never know what will be happening in the classroom and which book will be the best match for our mood! Theme reference page: Giving students a list of themes helps them to match themes to stories all year long. It is always wonderful to see students looking at their theme list on their own. Stories with stated and unstated themes: It is so important for students to see examples of both. I like to suggest to students that they reread the last page or paragraph of a story to look for a stated theme--if the author included it, chances are it's somewhere at the end! Theme Unit: This includes three stories and activities to help students recognize and explain themes in stories. I don't usually write about the stories I've written because I'm secretly afraid that someone will tell me I shouldn't write stories anymore. Isn't that silly? One of the stories ("The Arguing Knights and the Hungry Dragon) is a version of a tale that I made up for my sons--here is the original bit from an old blog post. Another story is a retelling of a Grimm fairy tale, while the last, "Evening Adventure", was written after my students fell in love with metafiction. Theme PowerPoint: This is a very simple introduction to theme. Theme is a challenge for students, but delightful in the end. After all, theme is what literature is all about! Reading stories from different authors and different places that show the same aspects of human experiences makes us all more human. Sharing that experience with 25 other people is just magical. Picture books are a great way to help students summarize. After an engaging shared read, teachers and students together can work to summarize the story. This helps students to learn about how to find important events, which details to include (and which ones to skip! ), and how to use academic language to write a skillful summary. Can I Play Too? by Mo Willems is fun for readers of all ages. There is a problem presented in the story, an attempted solution that doesn't work at all (kids love this page), and a happy ending. The combination of dialogue and pictures removes all temptation for kids to copy events from the text. Instead, they need to translate what happens on the page into new words. Perfect for summarizing! 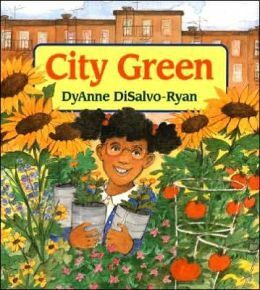 With older students, this book is a great way to introduce theme and try to weave a theme into a summary. Would it be best to put the theme at the beginning? Or at the end? 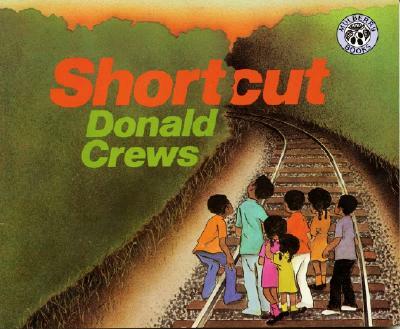 Shortcut by Donald Crews is one book that I would not be able to teach without. I use it for so many things--personal narratives, character emotions, point of view, and summarizing. Like Can I Play Too?, the pictures carry a great deal of weight in the story. This book really shows the flatness of a summary versus a narrative as a finished summary of this book includes the main events, but carries none of the suspense and excitement of the original. This is definitely a book that you will love to have on your bookshelf. 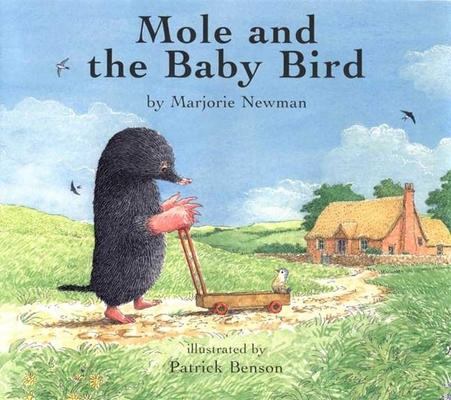 Mole and the Baby Bird by Marjorie Newman looks as if it is meant for a very young reader. However, many readers can identify with the main character's desire to keep a wild bird as a pet. This is a good book to read with students who are struggling with how to represent dialogue in a summary. How can we translate the character's words into sentences? This book is also helpful to use to review the difference between summarizing and retelling. 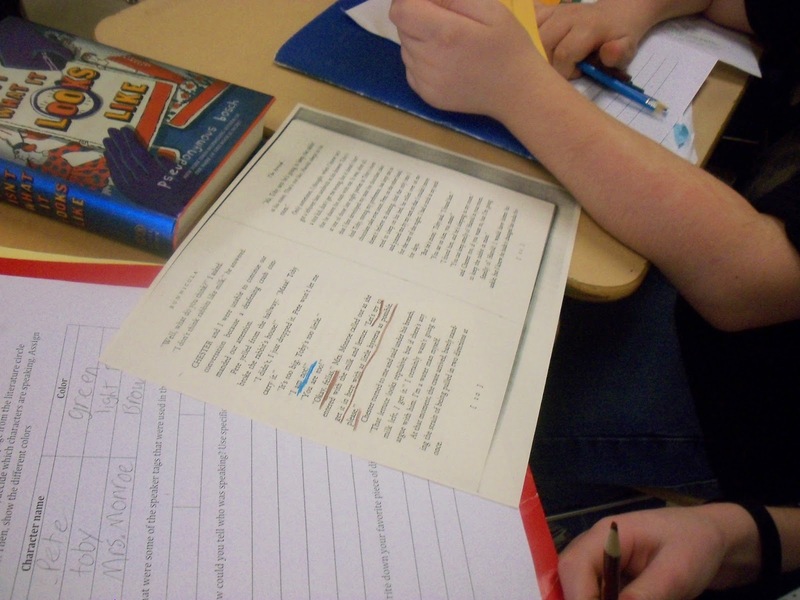 Many students identify so closely with the events in the book that they want to include every detail in a summary. Which events can be deleted, and why? You can find more activities for summarizing stories in this unit, Summarizing Stories, from TeachersPayTeachers. 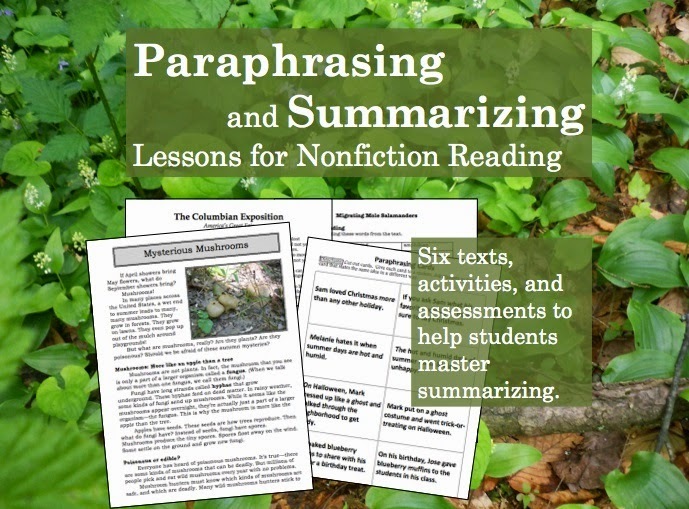 For more on summarizing, check out my book, Summarizing, Paraphrasing, and Retelling. What books do you like to use to teach summarizing stories? Summarizing a narrative seems like it should be easy. After all, stories are told in chronological order. We experience life in chronological order. Stories have a clear beginning, middle, and end. However, anyone who has ever read student summaries of stories knows that this is not always an easy skill. Sometimes a student summary reveals that a student is reading with shallow comprehension, not attending to place names or character names. Sometimes a student summary shows that a student did not understand how the pieces of a story fit together. And sometimes a summary reveals that a student is struggling with deciding which information is important and which details are not important. Here are some fun classroom activities that you can use to teach students how to summarize stories. Retold in 60 Seconds: Can you retell a story in 2 minutes? 60 seconds? 40 seconds? This activity is fun for everyone and really helps readers to consider which events and details can be left out, and which ones must be included. Solving the Retelling Problem, Part 1: Some of my favorite resources for getting kids started with retelling. Solving the Retelling Problem, Part 2: Struggling readers need lots of support as they manipulate figures to retell a story. This anecdote explains how I coached a reader through this. Collapsing Lists of Events: When student summaries are too wordy, they often benefit from learning how to collapse lists of events. 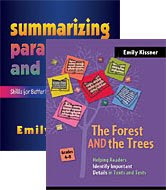 Summarizing Stories: This unit has resources for teaching students how to summarize dialogue, collapse lists of events, and summarize parts of stories. Yesterday I wrote about teaching paraphrasing. 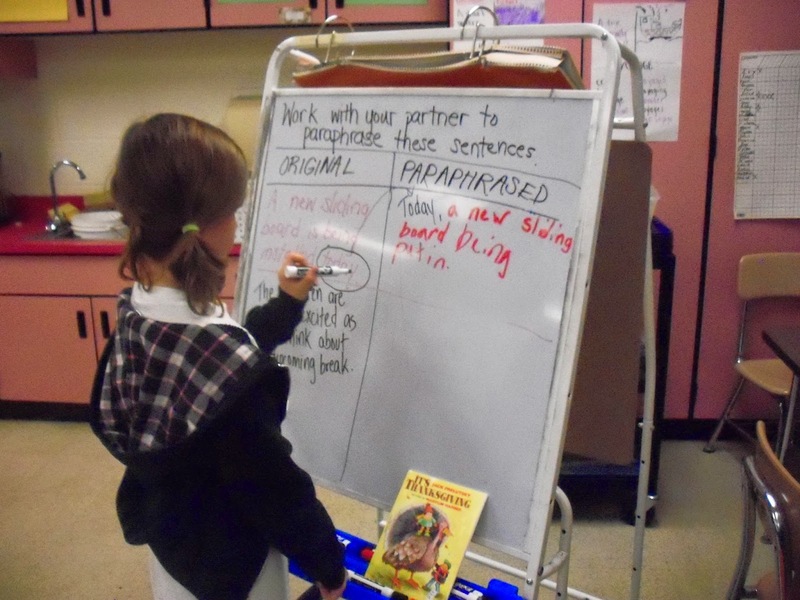 Readers need to be able to paraphrase, and to have fun with putting ideas into new words. 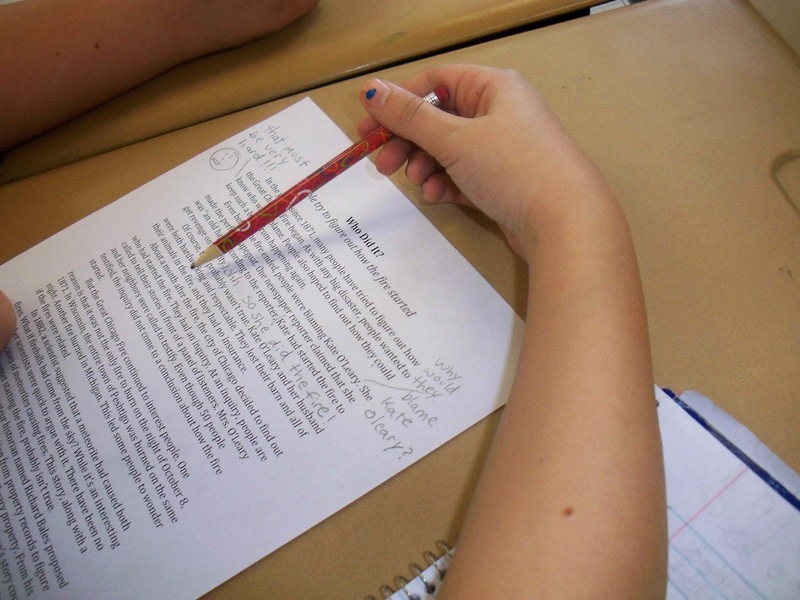 How often should students write summaries? In my classroom, they become fairly routine assignments, with students summarizing texts every two weeks or so. I like to start with "What was hard for you?" to help me gain some insight into the reader's processes. If a student says, "Nothing" then I worry--every summary offers some challenges and I want readers to have control over what they are doing. Sometimes readers talk about the structure of the text, or the difficulty of putting lots of information into a few sentences. Having two students compare summaries makes the complete circle back to paraphrasing. After all, no two summaries are ever the same. Seeing how their classmates solved the problem of summarizing in different ways helps students to see the dazzling array of ways to express ideas. Waaayyy long ago when I taught seventh grade, I had a folder in my filing cabinet called "Paraphrasing". I had a few worksheets in the folder, things that I would use to try to teach paraphrasing, but my heart wasn't in it. I didn't really see the purpose. Now, of course, I realize that teaching paraphrasing is at the heart of all learning. To paraphrase is to put someone else's ideas into your own words--which is what we do all the time when we are learning new ideas, seeing new images, gathering new experiences. When we teach students how to paraphrase, we teach them how to make information their own. Paraphrasing doesn't just live as a lesson or two in a research unit. Paraphrasing is in everything we do. Teaching paraphrasing can be far more interesting than dusting off some worksheets! Here are some activities that help students recognize the importance of paraphrasing and learn how to do it. Translating images to words (and vice versa) is a good way to help readers to think about how ideas are conveyed. For example, my youngest son and I had a great time at the National Gallery looking carefully at the images and paraphrasing what we saw. Turning a picture into a sentence encourages readers to consider words and explore relationships. 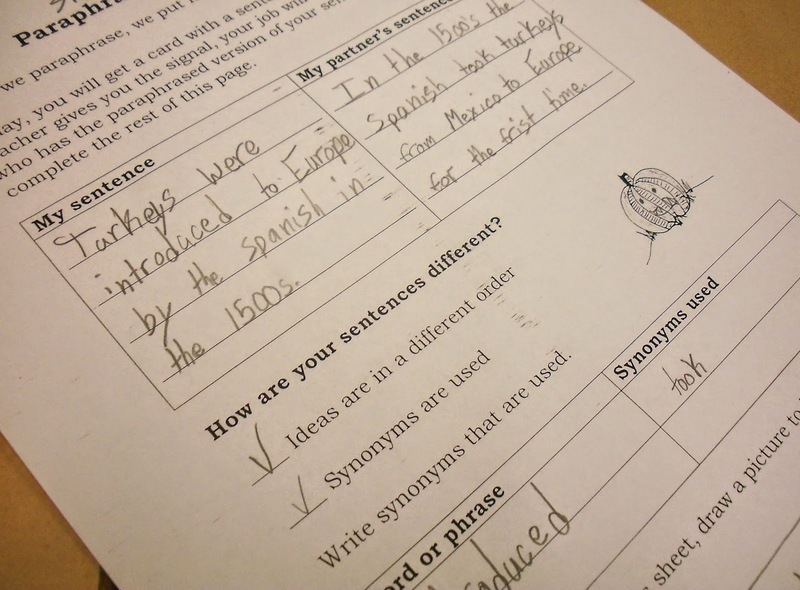 Paraphrasing skill, then, requires that students be able to replace words with synonyms. Students also need to be able to figure out how rework and rearrange sentences. This is tough! I've had students tell me, "That sentence cannot be rearranged"--when of course it can. Playing around with sentences and their arrangement can help students to improve with paraphrasing. Showing students examples of two sentences that convey the same idea in different ways helps them to see how paraphrasing works. I like to use a card match activity in which each student has a sentence, and then they have to find the person who has the paraphrased version of their sentence. Partners then look at how the two sentences are similar and different. Which words can be replaced? Which words cannot be? For example, one student has the sentence Jane enjoys hiking through the forest on crisp autumn days while another student has the sentence During the fall, Jane likes hiking through the woods. Autumn can be replaced with fall, but the word Jane must stay as it is. We've all read examples of bad paraphrasing--a student who misinterpreted a word or misjudged an author's meaning. I like to show intentional cases of bad paraphrasing, especially examples with the copy-and-delete method. Can a reader just take out words here and there? How does the meaning change? This approach can be more fun than ordinary paraphrasing, especially if you create amusingly bad versions of your classroom rules. When students ride texts on similar topics, they naturally find and notice examples of paraphrasing. These natural examples help readers to build awareness of how ideas can be expressed in different ways. It can be helpful to make charts to show how important ideas are stated and restated in different ways. Intermediate students are often quick to notice how some beginner texts state ideas in simple terms, but lose some meaning in the process. -Text structure assessments are now available on Frolyc. These assessments are designed to be easy to publish to student iPads. I'm looking forward to paperless assessments! You can find the Grade 3 assessment here and the teaching guide here. Each summer I wonder what kind of task to send along in the welcome letter for students. I like tasks that are inviting, that give an impression of what we will do together in the coming year without being too cumbersome or daunting. Last summer we sent Squiggles, which were fun. Each student received a squiggle, which they could decorate as they wished. The students brought their squiggle drawings to school on the first day to share. We loved seeing how the students all took the same beginning shapes and created imaginative designs! 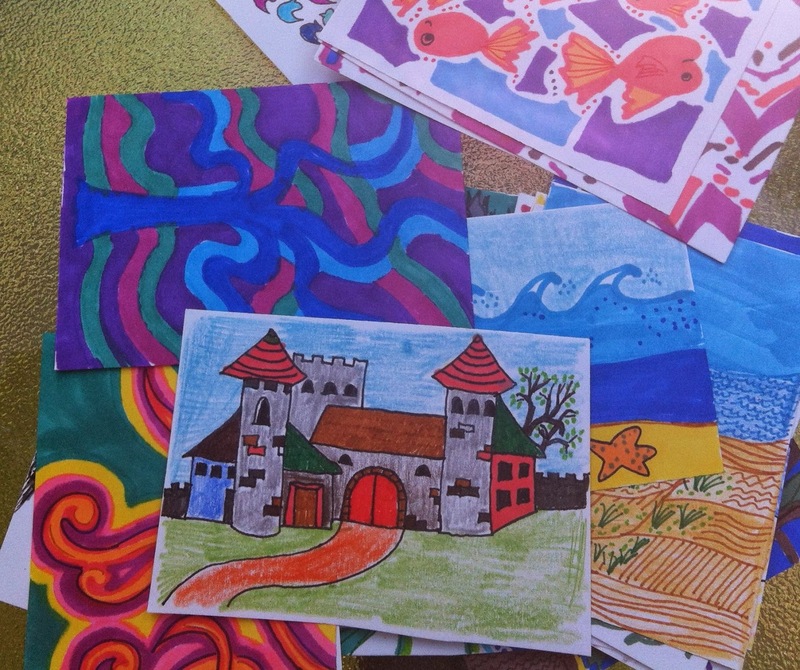 At the end of this school year, our art teacher organized an Artist Trading Card session for the last day of school. Students had been making cards all year, and each had a handful to share. Caught up in the usual end-of-year flurry, I only made three. Of course the kids all wanted to trade with me and I didn't have enough to trade with everyone. This year, then, we decided to start with the trading cards! Each student will get two blank cards in the welcome to school letter. I've been spending summer days doodling away on cards to send along in each envelope. Each student will get one completed card and two blanks, all for trading (or not) on the first day of school. It hasn't been as daunting a task as I thought. 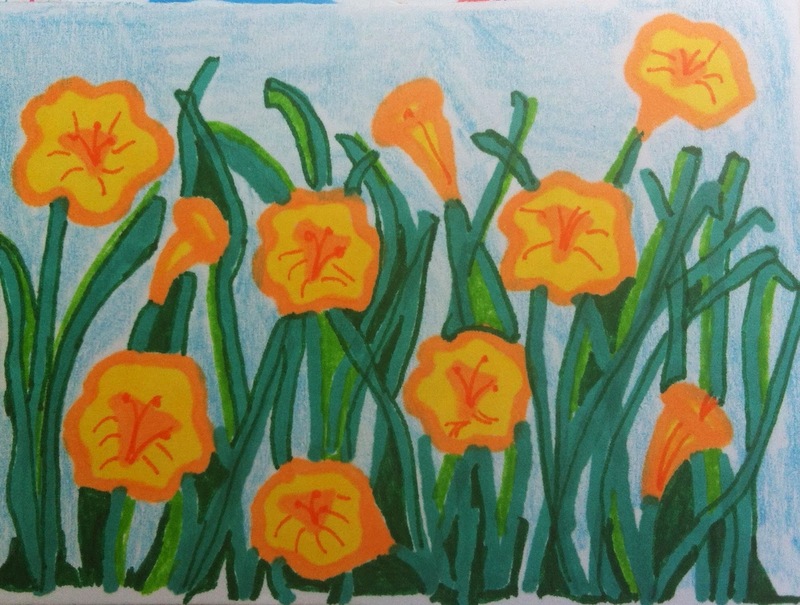 In fact, the cards are the perfect size for quick doodles and experiments, and have given me a purpose for trying out techniques and looking at my garden in a new way. 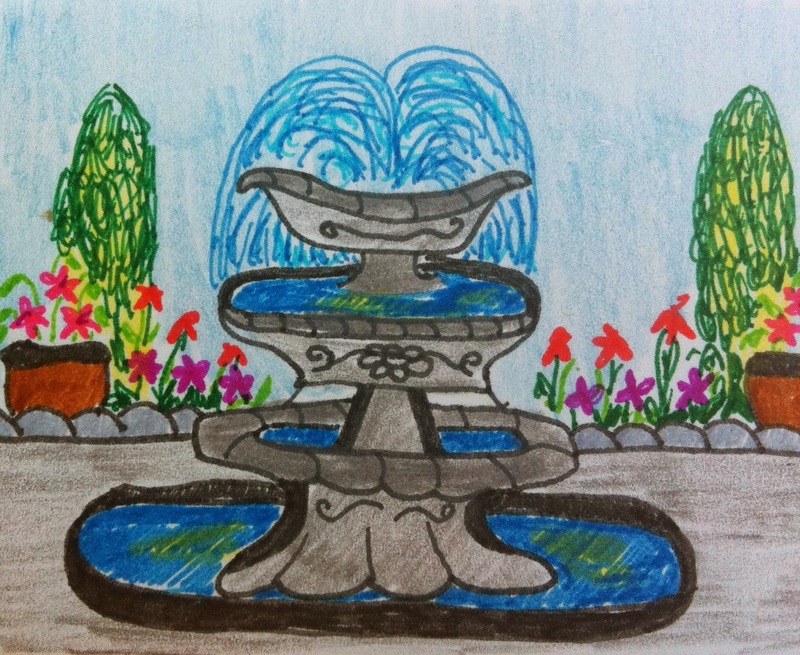 Last year's students all liked the fountain doodle, so I've made a few variations. This is a very old style for me, first perfected around the notes from my tenth grade World History class. Yesterday a new image crept into my drawing. Oh, no! What is this? Fall leaves? 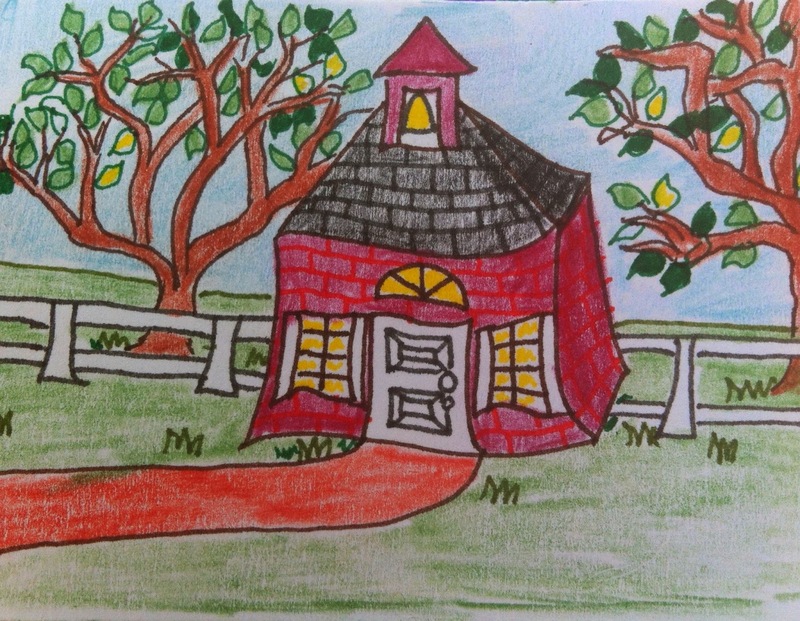 An impossible schoolhouse? Oh, well. Fall can't come too soon--I still have 20+ cards to make. -Have you tried Frolyc yet? I have lots of my texts posted there. It's an easy way to quickly publish content to student iPads. -If you also have September on your mind, you may want to go ahead and check out my September reading homework packets. Four high-interest texts with parent-friendly directions, comprehension questions, and vocabulary activities. -Teaching About Theme is a great set of activities for the beginning of the year. Multi-level stories and activities are all focused on the topic of theme. -I've made several revisions to my pack Text-Based Inferences and More. Included is an interactive PowerPoint modeling the inference making process, assessments, and the kid-friendly Max Mission passages.